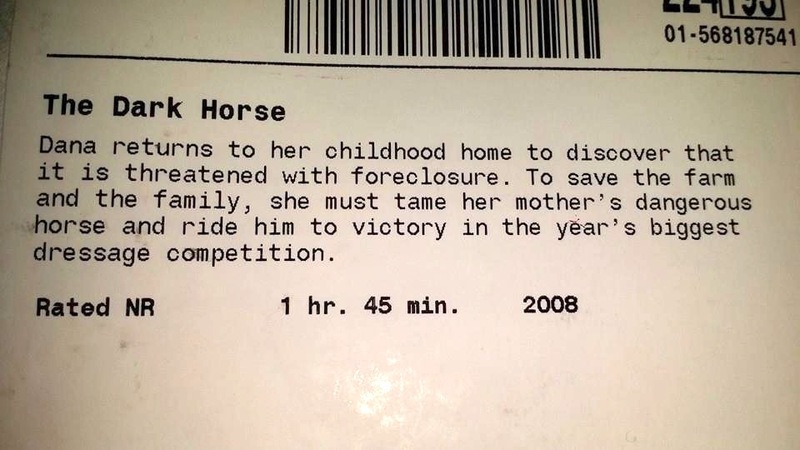 Saturday night's Netflix selection features The Dark Horse, the story of a girl who's going to save her family farm from foreclosure by winning a big dressage competition. I'm guessing this would fall in the genre of fantasy. How many weeks does she have to accomplish this? I assume it would take more than a training level competition to save a house from foreclosure. Marsha Mason starred in a movie The Long Shot where the horse is a GP horse but he "can't canter." Zac Efron is a wannabe jockey in another film with the embittered trainer who takes him on (because Zac's character's father hates the idea of his son riding horses). Zac, who rides with his hands up by his shoulders (and about shoulder wide) is "the most natural rider I've ever seen" according to the "embittered trainer"--and rides a chestnut toward the fence; cut to the legs of a bay landing on the ground. Can't find the name of the Efron movie--IMDB.com has changed the listings so you have to search for the filmography (by type, by year, etc.) and it's a cumberson process. Bottom line, The Dark Horse has its own genre. Good for laughs, but bottom line: Oh dear.